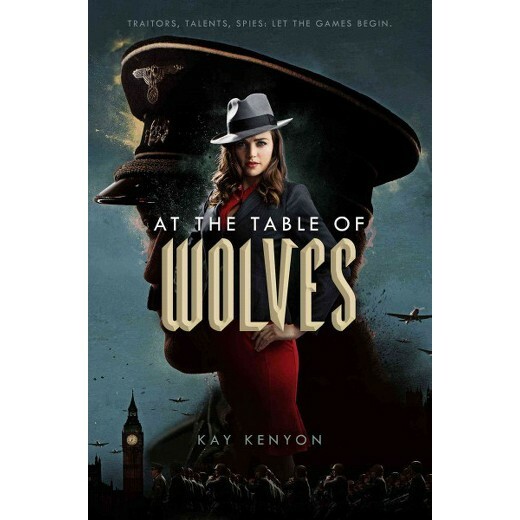 At the Table of Wolves is the fantastical, spy-thriller I didn't realize was missing from my life, and now, all I want is more! It is the spring of 1936. Kim Tavistock, born in Yorkshire, England but raised mostly in America. She has been living with her father in England for the the past three years after a controversial article she wrote cost her her job at a Philadelphia newspaper. At thirty-three years old, Kim is uncertain of a lot of things, but especially about her Talent. During the bloom, an onset of Talent development within random individuals of all ages but without a known origin, Kim gained the spill Talent. Rating a level 6, on a scale of 10, Kim has been working with a top-secret government run organization, Monkton Hall, researching Talents. However, Germany has been studying Talents for nearly a decade already, seeing potential for their application in war. Kim has hated her Talent since its onset in her adolescence. The spill Talent causes people to share guarded secrets and while helpful as a journalist it often made friends fearful of being around Kim, even if they didn't understand why they were sharing too much. Her work with Monkton Hall provides a cover, that she is working on a writing assignment, and it helps give her some purpose after the scandalous dismissal in America. Kim's case worker at Monkton Hall asks her to help uncover some evidence against a potential spy within their ranks. When her Talent produces needed intelligence beyond what even the highest levels of British Intelligence are aware of Kim finds herself swept up in trying to get answers. The novel only takes place over the course of a couple of months, contributing to the fast-paced plot. And yet, I felt as though I'd spent years getting to know Kim, speaking to Kay Kenyon's skill and how she crafts such a real character in Kim Tavistock. Kim doesn't magically become the perfect spy, nor is her Talent a flashy one. She is anxious about life and her future, troubled at he lack of a relationship with her father, but she is still driven to do more and try for more. An animal lover, devoted friend (to the few she has), I can see myself in her. One of the things I enjoyed most about this world are the characters and how events are happening at lower, everyday people kind of levels. This isn't top-tier, Bondesque spies reporting to a nation's leaders. This is bureaucrats and people simply doing the right thing trying to determine if their boss is a traitor to England, dealing with the frustrations inherent to dealing with a chain-of-command, trying to make the people with actual training move and take action. It made for a really immersive read because the people felt so real. This is how things could actually happen. A slightly bumbling, well-meaning woman with a not-so-flashy Talent she can't even perform on command tries to do the right thing. Kenyon is definitely one to watch. I was sucked into At the Table of Wolves because the book as a whole flows so perfectly. I love everything about this book. I especially love that we might get more in this world. I want to see what Kim is capable of with proper spy training. I want to see if she can hone and control her Talent. I want to see what other Talents might exist. There is still so much to explore in Kenyon's world and I'd love a pile of Kim Tavistock books on my shelf! Nerd Coefficient: 8/10 - A new series perfect for the big screen and your bookshelf! Reference: Kenyon, Kay. At the Table of Wolves [Saga Press, 2017] Our scoring system explained.